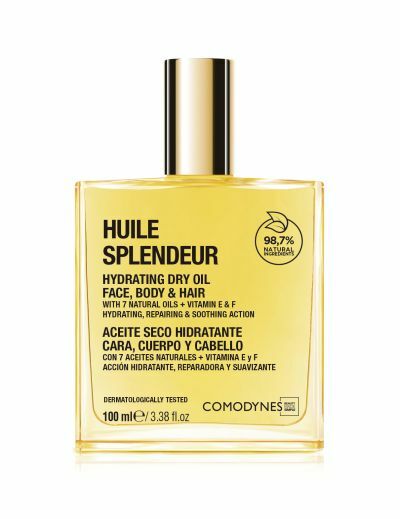 Comodynes, the innovators of the sunless tanning and makeup remover towelettes, has added a NEW hydrating dry oil for face, body and hair to their offerings. Made with 7 natural, organic oils (Wild Rose, Macadamia, Argan, Olive, Avocado, Rosemary and Carrot) and vitamins E and F, Huile Splendeur moisturizes, repairs and softens even the driest hair and skin. The proprietary, 98.7% natural formula quickly penetrates skin leaving it soft and supple, and with no greasy residue. Instantly boost hydration and shine to hair with a few spritzes onto damp or dry hair. Style as usual. Remember: a little goes a long way!